I often wonder where I'd be if I hadn't made certain decisions in my life. From the perspective of age, I can look back and know for certain some turning points - events or decisions that took me off in another direction. Forty-seven years ago today, I saw the Eiffel Tower for the first time. I had made the decision to go to France to study for the second semester of my junior year (I use the word "study" lightly, as I ended up making my worst grades ever). At that time, it was not cool (outdated word) to go to Vanderbilt-in-France. I had been caught up in the sorority-fraternity scene and considered myself in the "in" group (my opinion only). At any rate, one fall day when I must have been feeling bold, I signed up to go to Aix-en-Provence in the south of France. I had never been out of the country before and had taken only two years of college French. But, in high school, where we didn't even have a French teacher, I was already drawn by the thought of Paris. So, on February 2, 1966, I walked out onto the Trocadero overlook and gazed at the Eiffel Tower. I was hooked. Every vacation since, I've wanted to go back to France. Even when we arrived in Aix-en-Provence a couple of days later and saw the huge plane trees clipped and bare, I was enchanted (by May, the leaves were back and the limbs stretched across Cours Mirabeau, the main street of Aix). I loved everything about France. Yes, I'd heard all my life how they owed us for the Marshall Plan and treated tourists badly. But, I didn't care. 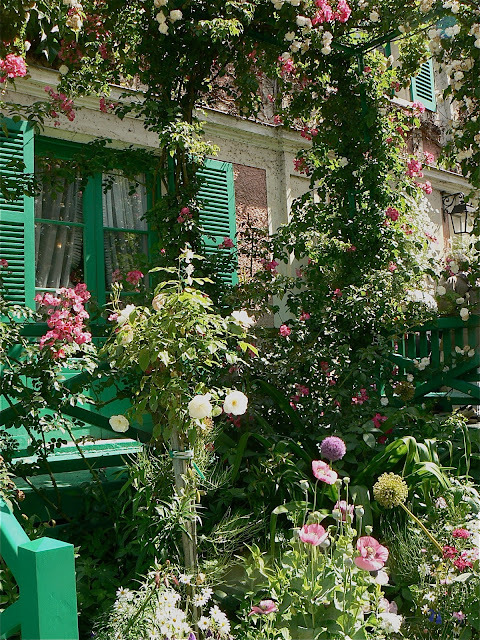 I learned to love the French aesthetic - the stucco houses and tile and slate roofs, the painted shutters, the clipped hedges and vines covering walls. I liked the bustling markets and the the clothes in the windows. I ended up, off and on, living in France for about two years. To this day, I still have friends I would never have known had I not made that initial leap. There are other decisions I made that did not turn out so well, but that's one I've never regretted. Note: The photo is of Monet's house at Giverny, taken this past summer. I've never been out of the USA let alone Paris! Thank You so much for sharing your photos and adventures with me. I love reading about your journey. A Gardener's Diary should be be on tv every week with Erica sharing the next adventure. I would have never been able to enjoy these gardens you have both showed the world. I'm still hoping you will continue sharing the magic of these gardeners. Nobody does it like your team.